Captain’s won their Region to make it to TOP 10, BUT it’s NOT OVER YET! CAN CAPTAIN’S WIN THE NATIONAL FISH & CHIPS AWARD 2018? is announced Jan 25th 2018. Captain’s are now in the final stage running to be crowned no.1 fish and chip shop in the UK. After entering the annual awards in May 2017 Captain’s were delighted to become the winner of their region (Hampshire, Hertfordshire, Oxfordshire, Buckinghamshire, Berkshire & Bedfordshire). 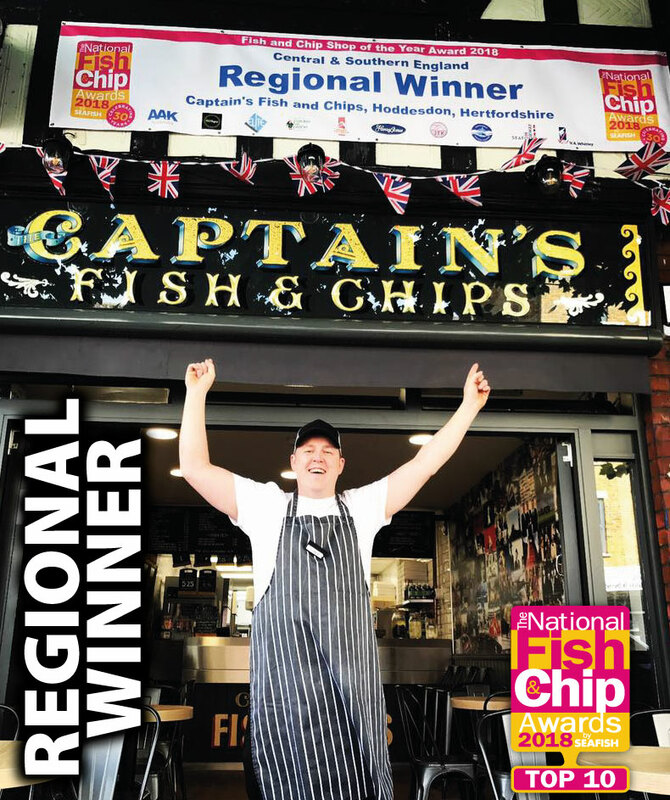 Captain’s are now recognised as one of the top 10 fish & chip shops in the UK. The final hurdle will be meeting the panel of 13 Judges on Jan 25th 2018 at the Lancaster Hotel London where they’ll meet the judges, answer questions and do a 10 minute presentation. Who will be 2018’s 1st Place Winner? We need your support! Like our Facebook page & leave a review. We need your support! Thank you for following our journey. Your support and loyalty doesn’t have to end there. Each review left on Facebook bring us closer to our goal! Help us become UK’s No.1 and leave your feedback today!